Hello, boys and girls. You’d better sit down. I’m afraid I have some bad news. The Mr. Dalek story did not get finished this year. There were certain – problems. It was Christmas Eve of a certain recent year when I came to the North Pole. I had received a mysterious invitation, telling me that my skills as a narrator would be needed. The North Pole is just like you imagine. Snow, ice, polar bears, and a crazy sign with directions to locations thousands of miles away. About half a mile east of this menagerie was Santa’s workshop. The workshop was finishing making all the toys and goodies for good little girls and boys. The elves were hard at work feeding Santa and the Reindeer so they would have the energy to make the arduous trip around the world. I passed by the reindeer – Blitzen and the 7 lesser known chaps. In front of the classic eight was their leader, wearing a red nose taped to his plunger. Plunger? Good grief. Mr. Dalek was impersonating Rudolph the Red Nosed Reindeer and taking the lead on Santa’s sleigh! ‘YOU invited me to the North Pole?’ I exclaimed, trying to make some sense of this situation without passing out from the thin air at the North Pole. I reluctantly agreed to go along with Mr. Dalek’s request. How many chances would I have to travel in Santa’s sleigh? And to be fair, given how light the air can be up high, wearing a spacesuit made sense. I put on Alex’s old spacesuit. It was a struggle – I knew I should have gone to the tailor shop and get them to let the suit out from her size to my size. So, here I am, a respected podcaster, hiding beneath the sack of gifts in Santa’s sleigh while the old fellow climbed into the driver’s seat of the sleigh. Santa turned on the traction control and activated the atmospheric bubble around the sleigh to protect him in flight. Maybe I did not need the spacesuit after all. Mr. Dalek and the reindeer started to run and we launched into the air! ‘Happy Christmas! Merry Christmas! Let’s go cheer some children of all ages!’ With this brief speech, Santa expected Rudolph to lead the sleigh on its appointed rounds. Santa Claus, alarmed! ‘You’re not Rudolph! And the sleigh is seriously above its appointed weight. Tony – stop hiding in the back and come out here!’ How did Santa know I was in the sleigh? ‘Santa knows what all the bad girls and boys are up to!’ Oh dear. So, Mr. Dalek led the reindeer and the sleigh on a rapid race through the stratosphere, into outer space, and up towards the moon. Santa Claus and I sat next to each other. Santa looked grumpy and furious. I wanted to crawl into a little ball so no one could find me. We landed on the bright side of the Moon, where Mr. Dalek said we had fellow Christmas visitors to meet. The visitors approached in big, massive spaceships. The first ship opened – Cybermen! The second ship opened – Ice Warriors! The third ship opened – Draahvin! Well, I guess not all alien threats can be equally dire. And the fourth ship opened – Cuthulu and his children! Santa refused to participate, so I had to haul the sack of gifts to Mr. Dalek and his Felonious Fiends. Don’t they understand that my back aches? Why had Mr. Dalek betrayed me once again? Sure he betrayed me so many other times – oh. Feeling rather foolish, I handed over the sack of stuff. It had been a while since I had gotten any toys from Santa. Too many years of being naughty, I guess. I expected shoes, cars, trucks, dolls, rubber duckies, board games, and the like. Instead, Santa’s sack was full of technology items. Ipods, Ipads, Kindles, Video Games, Blu-Ray Players, HDTVs, Robot Toys, Toys for the Robot Toys to play with, Flash Drives, and Gift Cards. THESE were the items in Santa’s sleigh! THESE TRAVESTIES were what the kids of today wanted for Christmas. Suddenly I didn’t feel so bad about Mr. Dalek giving this garbage over to alien invaders. I had to stifle a giggle when the Cyberleader revealed that an Ipad would triple his memory capacity. The Christmas party went on for several days. It wasn’t like Santa, the reindeer, and I could get back to Earth without a navigator. Mr. Dalek and the monsters were partying heartily with the toys that should have gone to the good little girls and boys. All on the bright side of the moon, where humans could see us easily from the Earth. Mr. Dalek came over to me. ‘On my signal, we all get in the sleigh with Santa and keep our heads down.’ I began to wonder if Mr. Dalek was being really, really, clever. Sure enough, on the 28th of December, we saw the spaceships coming. An international fleet of ships had set out to rescue Santa and avenge the interrupted Christmas celebrations. The Americans had refurbished one of their NASA space shuttles. The Soviets launched a capsule. The English launched one of their swanky space rockets that they claimed for years that they never built. The Scottish launched a swinging fireball ship to recognize Hogmanay. Richard Dawkins launched a ship to try to claim that they were out to avenge the interrupted Solstice celebrations. All of those ships were about to reach the Moon, because Mr. Dalek had held the party where all Earth could see us. ‘Mr. Dalek, you betrayed us! I knew we should never trust a man!’ screamed the leader of the Draahvin. Honestly, the Draahvin had been unhappy for the full visit, just because their Doctor Who story was lost and they weren’t getting royalties from repeats, VHS titles, and DVD releases. 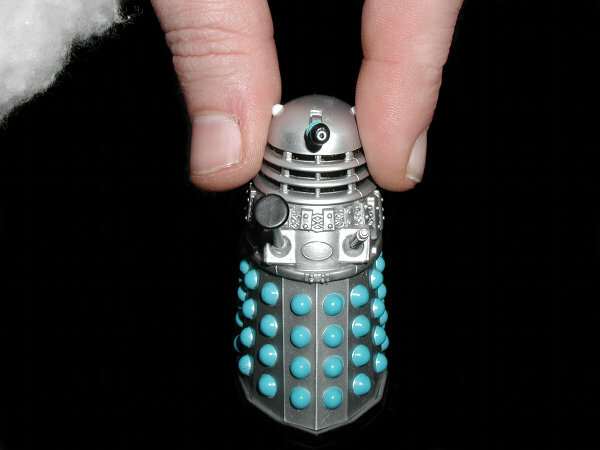 ‘Oh no I didn’t!’ proclaimed Mr. Dalek, while motioning Santa and I towards the sleigh. ‘Oh yes you did!’ retorted the Draahvin, this time with the Cybermen agreeing with them. As we hid in the sleigh with its shields protecting us from angry aliens, I asked Santa about the identity issues. It seems that the original Saint Nicholas decided that the full world would be too hard to focus on, so he cracked his identity into all these regional variants, including Santa Claus and Father Christmas. I mentioned that this did not make sense since they were all still in one body, and Santa threatened to bury my whole city block in Coal, with a “from Tony” card attached to it. The humans made short work of the aliens, because the humans just wanted Christmas more. Mr. Dalek tricked the humans into thinking that he had nothing to do with the hijack, but that he had manipulated the aliens to be sure the humans caught them. Santa’s sleigh was towed by the English rocket back to Earth. I had to ask Mr. Dalek – why did you do this? Why spoil Christmas for humans? Why trap those aliens? Why have we gone through a full story without you exterminating anybody? Mr. Dalek looked at me with a mischievous smile. Hold on – how can a Dalek smile? Benjamin, this doesn’t make sense. Benjamin? Well, he’s already written this, he won’t answer. Ok, I’ll just try to sound convincing. Mr. Dalek looked at me with a mischievous sm … sorry, I can’t do it. I’ll compromise – Mr. Dalek looked at me conspiratorially. You may be writing some of these stories, but as long as I am the narrator and I run the audio versions, I make the rules. So there. ‘You do realize you just united the whole Earth for the first time. That mission to rescue Santa could lead to World Peace. The encounter with aliens could then lead to a joint space mission and humanity conquering the galaxy. So, you made life better for humanity, in the end.’ I couldn’t resist needling Mr. Dalek here. ‘There are species that need to be enslaved. Until the Daleks can get around to it, why not let the Humans enslave them first? And this way, humanity can be evil as well. As an agent of evil, I’m fine with this,’ said Mr. Dalek with smug satisfaction. Have a wonderful Christmas and holiday season, all of you. Mr. Dalek will be back, unless I’m very, very fortunate. And if you are part of the secret space missions to enslave the galaxy under the yoke of human oppression, do remember to get your spacesuits altered at your local tailor before leaving Earth – they can be very uncomfortable when they’re too tight. And to all, a good night. Saint Nicholas was a real person, and Santa Claus is just a reworking of him, so everything but the Doctor Who bits are fair use. Doctor Who is copyright the BBC, and we always appreciate their benevolence towards parodies and humourous fan productions. All original material is copyright 2011.